Knife Rights Chairman Doug Ritter said, "The Federal Switchblade Act was an asinine idea when it was passed in 1958 in a wave of Hollywood-inspired politically motivated hysteria and has only become more irrelevant as time has passed. The majority of states have always allowed switchblade possession and with Knife Rights' repeal of switchblade bans in 11 states in the past seven years, fully four-fifths of the states now allow switchblade possession to one degree or another. With a Congress and Administration that may be inclined to finally rid the country of this abomination, it is way past time to repeal this law that only serves to interfere with lawful trade and commerce." Ritter continued, "from the start Knife Rights has fought successfully to defend the right to carry a knife, an essential tool, in the individual states, cities and towns. The Knife Owners' Protection Act represents a key step to protect law-abiding knife owners simply passing through areas like New York City where possessing many commonly owned knives that are legal elsewhere may result in arrest and prosecution." Besides legalizing interstate trade in popular automatic knives, the measure allows for the secure and safe transportation of knives through jurisdictions where the mere ownership of a certain type of knife is enough to bring arrest and criminal prosecution. 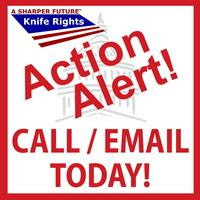 "KOPA will simply provide safe harbor to someone traveling with knives where they can legally be possessed at the points of origin and ultimate destination," Ritter emphasized, "the bill requires they be locked up during travel in states where they would be illegal. It eliminates the constant jeopardy of criminal prosecution for simply passing through an area. It offers no protection to anyone engaged in criminal activity." Knife Rights' KOPA includes teeth to defend those who travel under its protection because it also provides penalties for law enforcement, prosecutors and others who ignore the protections provided. 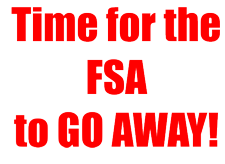 Similar to the protections and penalties generally provided in USC 1983 to those whose civil rights are violated, a falsely arrested citizen can be compensated for the expense of defending themselves from an unwarranted violation of the rights Congress protected in KOPA. I support the Knife Owners' Protection Act of 2017, H.R. 84. I urge you to become a co-sponsor of this commonsense legislation that will protect my rights and the rights of all knife owners to travel throughout the U.S. without fear of prosecution under the myriad of state and local knife laws and it also repeals outdated federal provisions related to switchblade knives which burden citizens and lawful commerce in these popular and widely available tools that are legal to possess in 40 states.